The Stone of Practicality, Stone of Ascension, Focus, Clarity, Release of Ego. 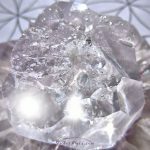 Cubic Zirconia resonates with the Third Eye Chakra, promoting clear pathways for vision work. Do you find you are running into setbacks often? The stone opens the third eye chakra to a greater sense of environmental awareness. Its optical and focal properties encourage using a practical view to see through challenging circumstances or matters. It opens perspective to see the beauty, light and the hidden significance in all. 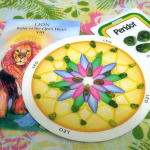 This crystal also resonates with the Crown Chakra, connecting with higher knowledge. The original raw chemical element which creates the crystal is found in stars, meteorites and samples of lunar rocks from Earth’s moon. And, the intelligence guiding the creation of the first of the cubic zirconia stones was the coming together of gurus in their respective fields. To accomplish the final product, new technology was required and was based around purification, sterilization and allowing openness for new convention. 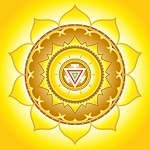 Cubic Zirconia works to release the Solar Plexus Chakra from projecting ego. It teaches one to release intimidation and fear of judgement. 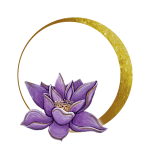 With this in mind, it offers liberation from the conventions & matrices of the material world and opens our will to a flow with humble acceptance of the value of human potential. Consequently, this can help shift perspective to one that is sobering and more practical. Since the the raw material is transparent and reflects light well, you would expect it to be very lightweight and dainty to hold. But, it is just the opposite and unusually heavy. Due to its unexpectedly heavy weight, the crystal is excellent for grounding the practical perspectives it is offers. Finally, its light assists with healing autoimmune diseases such as arthritis, lupus, celiac disease, thyroiditis, tissue inflammation and connective tissue disease. The crystal’s properties are both protective and restorative. 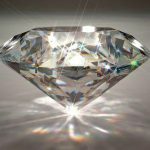 The Cubic Zirconia meaning and metaphysical properties come from an important history. 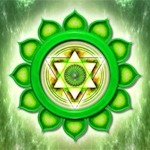 The metaphysical properties also connect to its creation – which you can read about here. Read here about how the stones are created. 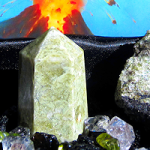 Do you believe this crystal has metaphysical properties? Are you a person who is able to sense the crystal’s energy? Let me know in the comments below! First of all, thank you for this post. I suppose it is due to this stone being synthetic that so little information is available with regard to its metaphysical properties. So, at least in my perspective the information you’ve shared here is valuable. 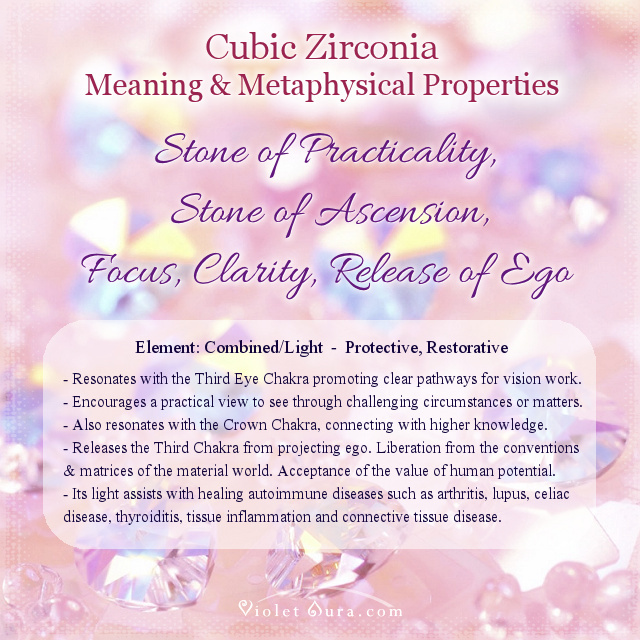 To answer your questions, yes, I do feel cubic zirconia has metaphysical benefit. I was recently given a cz bracelet as a gift and within only a couple of hours of putting it on I found myself rattling off a very practical solution to a complex and rather difficult situation. And quite frankly, I was stunned at the removal of projected ego on my part. Within minutes of putting on the bracelet I could feel its vibration all the way up to my shoulder and now, after having quoted myself to read your post, can feel its vibration in my chest. I am humbled to admit that I have dismissed the possibility of this stone having metaphysical benefit for years due to its being lab created as I am admittedly a bit of a closed minded snob when it comes to such matters. So your post was not only valuable in that it provided information, but it helped me to see an area where I was projecting limitation based on my own ignorance. The energy of stones are always powerful and healing,our spirit deep within us vibrates in frequencies similar to precious stones ,l love them ,they have helped me for years in my life……………….. In my experience, the stone helps to regain ancient ancestral lands. but I haven’t positively identified the stones, I base my conclusion on 2 instances, a recent acquisition, ring, the seller says it has white topaz accents but I still think they’re too fiery and seem to be CZ…. since getting it I got a fracture in my leg which possibly is secondary bone cancer… the silver lining is it might bring about cash insurance payout if indeed cancer, and could help me get to my ancestral land as planned. I’m in process of selling my house already before that. Second, I gave my stepmother a pendant I got in Korea, I imagine it was CZ, it was back in 2003. Since then she used the house I inspired and helped her get built to get extra loans and finance legal fight to save ancestral clan lands in Samoa. So I think there is a high price to the blessing, but it is special, and hard to come by such blessing. I had thought the stone is made by radioactive tech but apparently they use radio waves to create high heat. I’m thinking about purposely getting a definitely CZ stone. Just feeling around a bit and will do oracle. Appreciate any comments of experiences. Hello. I have arthritis and I’m looking at possibly another autoimmune disease. My Dr has had me blood tested. Today I’m reading this and today I am wearing a zirconia ring. If that doesn’t say anything I don’t know what does. I’m currently undergoing my spiritual awakening. It’s a cat 5 hurricane … to say the least. In my shopping therapy adventures I’ve been drawn to sterling silver and CZ jewelry. I was particularly drawn to this one ring. The CZ stone is HUGE! I wear it on my left hand. I’ve been experiencing days of psychic trembling. Wearing my crystals comforts me. I’ve joked to my family that I’m wearing my portable crystal ball … the stone is that big. Today I noticed the finger I’m wearing my crystal ball on kept jumping. I can feel its’ energy! It’s also a cool way to explain to people what Spirit looks like to me. Spirit looks like a quality sparkling CZ! Just like my “portable” crystal ball! I feel a connection to my new found friend. I actually feel like I’m cheating on my CZ if I wear a different ring! It’s crazy. whether or not a CZ can have metaphysical properties.